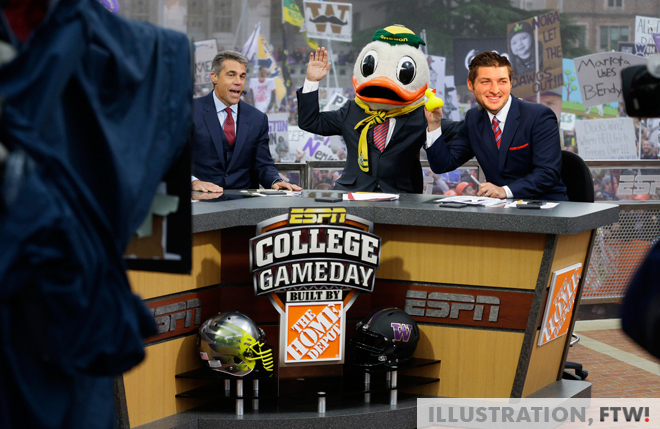 ESPN signs Tim Tebow for SEC Nation. Ex-Florida Gator quarterback Tim Tebow is returning to college football as a studio analyst for the SEC Network. The two time BCS and SEC champ and Heisman Trophy winner will make his broadcast debut on Jan. 6 during the 2014 VIZIO BCS National Championship game. Tebow is expected to be an analyst for SEC Nation (debuting August 28, 2014), a pre-game show that will travel through the SEC conference and air with live coverage prior to each week’s games. As Tebow stated, he is not giving up on the NFL and ESPN has acknowledged that his SEC Nation pre-game duties will not preclude him from attaining his football dream.